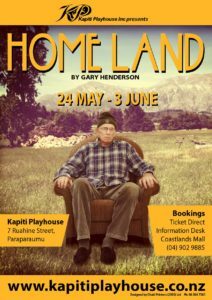 Book now for Home Land - Kapiti Playhouse Inc.
Kapiti Playhouse’s first production of 2017, Home Land by Gary Henderson, is on stage from Wednesday 24th May. This is a story about home – why we need it, why we have to leave, and why we always return. The play is on stage from Wednesday through Saturday from 24th May to 3rd June with a special matinee performance on the 28th May. Find out more, including how to get tickets, on the Home Land event page.